Many think Subaru brought the VIZIV and WRX Concepts to the Frankfurt Auto Show because they don’t have anything new coming out in the near future. But the exact opposite is true for the Japanese automaker. The two concept vehicles tell us everything we need to know about Subaru. What two things can we learn from the two concepts that reveal the future of the brand? Jake Fisher, director of testing at Consumer Reports told Automotive News recently, “Subaru is where the German brands, particularly BMW, were 10 years ago with no razzle-dazzle or gimmicks." Subaru sales are up especially here in the U.S. and they have done a lot of things right up to this point. Subaru sold 79% more vehicles in the United States last year than it did in 2008. They are producing cars that appeal to a niche market of loyal buyers, but they are also attracting new younger buyers who have never purchased a Subaru vehicle before. Their decisions have turned them from a minor niche player into a steadily rising, recession-defying brand. This year the brand is No.12 in U.S. sales through July, up from No. 22 in 2006. Subaru has passed Ram, Chrysler, Mazda and Buick, and they are only 1,980 units behind Volkswagen. 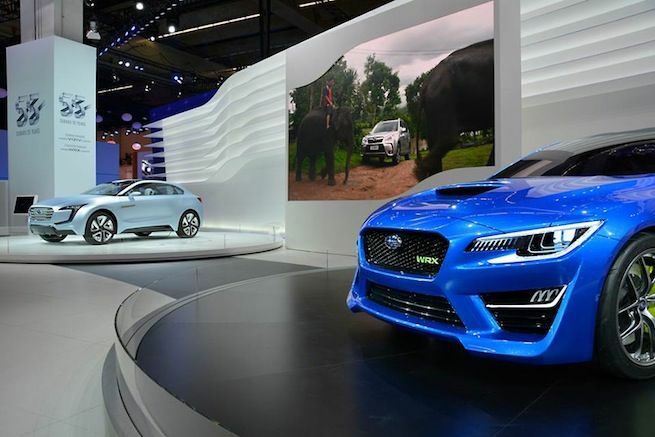 The new WRX Concept was unveiled in Geneva in March and reveals much about the brands future. They will continue to offer the WRX and WRX STI performance models going forward. We can look for more power and better performance from the hot Impreza model than ever before. Subaru performance fans can look forward to a new turbocharged intercooled engine with more power, a lighter more agile WRX STI with carbon fiber body panels, and improved handling from a tuned chassis. We can also look for even more AWD grip and road hugging performance from the patented Subaru Symmetrical all-wheel-drive system that is being improved. Subaru will continue to grow their new hybrid technology and the new 2014 XV Crosstrek Hybrid is the first model. The new VIZIV Concept gives us an idea of what Subaru will offer in the future. They have been criticized for having dull and boring designs. They will take a radical shift and Subaru will move to new design philosophy that is a radical departure from the past. It also shows the new technology that will power Subaru cars in the future. It will be powered by a new hybrid Boxer diesel with rear wheels 100% motor-driven eliminating the need for a propeller shaft. This creates a lower floor that offers ample legroom for rear seat occupants despite its compact size. The engine configuration will allow the crossover to feature the stylish two-door design and still have room for a rear seat and four passenger seating. The hybrid system will be very fuel-efficient. The motors start and drive the vehicle during low-speed or city driving, while the diesel engine and high-efficiency Lineartronic take over on the highway. The new system incorporates a "Hybrid SI-DRIVE" system with an "Eco-Cruise", "Intelligent" and "Sports" modes that provide coordinated control in conjunction with the new Subaru "EyeSight" driving assistance system. The WRX and VIZIV Concepts at the Frankfurt Auto Show IAA tell us a lot about the future at Subaru. It’s going to include high-performance, a new design philosophy and it will include fuel-efficient technology. Stay tuned to Torque News for the latest Subaru news.